It was a chilly 5 degrees this morning in Ottawa and my first thought (after at least 2 cups of coffee) was that dinner would be something warm to compensate for the fact that my furnace does NOT come on until at least sometime after Halloween. So off to the butcher I went and came home with some fantastically lean and freshly trimmed stew beef, potatoes and some carrots pulled from some farmer’s field this morning. Stew was on the menu! I love stew, I really do. It’s an easy, one pot meal that my whole family will devour, especially on a day like today. Browning the beef? No problem. Chopping onions? A snap. Peeling potatoes and carrots? Another story altogether. I hate to whine, but I strongly dislike peeling potatoes, possibly because it was sometimes my job growing up to do them for large family dinners…Oh, the mountain of potatoes I’ve peeled! I have tried fancy-shmancy peelers, cheapo ones and even an apple-peeler contraption that required securing it to my countertop. With potatoes, I found that I was forever going back to spots that were missed and finally resorted to using a good old paring knife. It does the job fairly efficiently but after peeling potatoes, my wrist would be killing me. No big deal, I’d mutter. What’s a little pain for the look of adoration I would receive when I set the steaming bowl of goodness on the table? Sigh, the things a mother puts herself through…. Yet even after a summer of virtually NO potato peeling, my wrist was not up to it today. Maybe it was the weather, maybe I’m just getting old….whatever. Then I spied a little miracle on top of my fridge. I found this at the Real Canadian Superstore for $3. I picked it up for my brother as a joke after he used one at my mom’s this summer. She suffers from rheumatoid arthritis and finds traditional peelers sometimes difficult to use. Promising to go back and get a replacement to send to my brother, I ripped open the package and slipped the soft flexible handle on to my middle finger. WELL. This little beauty was worth it’s weight in GOLD! I peeled a bunch of potatoes and carrots in half the time it normally takes me. Seriously. No cramping, no sore wrist, just nicely peeled potatoes. Ah bliss! I have to stress that I believe in the knife over gadgets. I use a knife more than any other tool in my kitchen. I picked this up as a joke for my little brother – but the joke was on me! 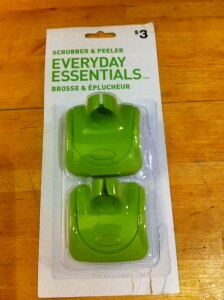 It’s useful, doesn’t take up much space and comes with a handy scrubber with the same handle for your finger. 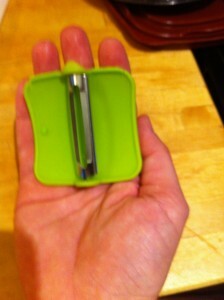 So there you have it people – a cheap inexpensive little doodad that made my day a little sweeter. You’re welcome. 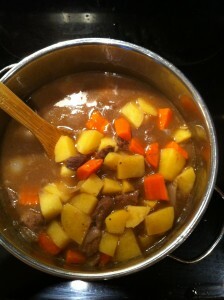 Oh yes, and if you want the recipe for the stew,click here. Trust me – it’s yummy!!! Variation here is that I added the potatoes to the stew rather than make mashed….